1 Then all the people of Israel came out, from Dan to Beersheba, including the land of Gilead, and the congregation assembled as one man to the Lord at Mizpah. 2 And the chiefs of all the people, of all the tribes of Israel, presented themselves in the assembly of the people of God, 400,000 men on foot that drew the sword. 3 (Now the people of Benjamin heard that the people of Israel had gone up to Mizpah.) And the people of Israel said, "Tell us, how did this evil happen?" 4 And the Levite, the husband of the woman who was murdered, answered and said, "I came to Gibeah that belongs to Benjamin, I and my concubine, to spend the night. 5 And the leaders of Gibeah rose against me and surrounded the house against me by night. They meant to kill me, and they violated my concubine, and she is dead. 6 So I took hold of my concubine and cut her in pieces and sent her throughout all the country of the inheritance of Israel, for they have committed abomination and outrage in Israel. 7 Behold, you people of Israel, all of you, give your advice and counsel here." 8 And all the people arose as one man, saying, "None of us will go to his tent, and none of us will return to his house. 9 But now this is what we will do to Gibeah: we will go up against it by lot, 10 and we will take ten men of a hundred throughout all the tribes of Israel, and a hundred of a thousand, and a thousand of ten thousand, to bring provisions for the people, that when they come they may repay Gibeah of Benjamin, for all the outrage that they have committed in Israel." 11 So all the men of Israel gathered against the city, united as one man. 12 And the tribes of Israel sent men through all the tribe of Benjamin, saying, "What evil is this that has taken place among you? 13 Now therefore give up the men, the worthless fellows in Gibeah, that we may put them to death and purge evil from Israel." But the Benjaminites would not listen to the voice of their brothers, the people of Israel. 14 Then the people of Benjamin came together out of the cities to Gibeah to go out to battle against the people of Israel. 15 And the people of Benjamin mustered out of their cities on that day 26,000 men who drew the sword, besides the inhabitants of Gibeah, who mustered 700 chosen men. 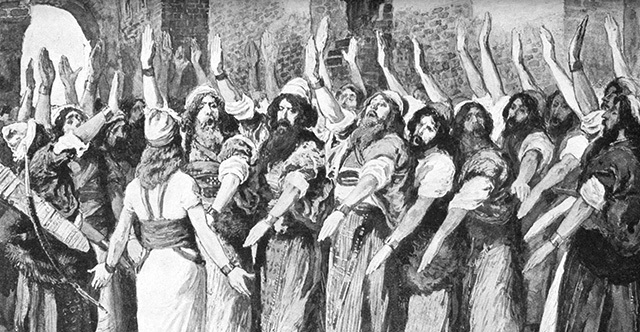 16 Among all these were 700 chosen men who were left-handed; every one could sling a stone at a hair and not miss. 17 And the men of Israel, apart from Benjamin, mustered 400,000 men who drew the sword; all these were men of war. 18 The people of Israel arose and went up to Bethel and inquired of God, "Who shall go up first for us to fight against the people of Benjamin?" And the Lord said, "Judah shall go up first." 19 Then the people of Israel rose in the morning and encamped against Gibeah. 20 And the men of Israel went out to fight against Benjamin, and the men of Israel drew up the battle line against them at Gibeah. 21 The people of Benjamin came out of Gibeah and destroyed on that day 22,000 men of the Israelites. 22 But the people, the men of Israel, took courage, and again formed the battle line in the same place where they had formed it on the first day. 23 And the people of Israel went up and wept before the Lord until the evening. And they inquired of the Lord, "Shall we again draw near to fight against our brothers, the people of Benjamin?" And the Lord said, "Go up against them." 24 So the people of Israel came near against the people of Benjamin the second day. 25 And Benjamin went against them out of Gibeah the second day, and destroyed 18,000 men of the people of Israel. All these were men who drew the sword. 26 Then all the people of Israel, the whole army, went up and came to Bethel and wept. They sat there before the Lord and fasted that day until evening, and offered burnt offerings and peace offerings before the Lord. 27 And the people of Israel inquired of the Lord (for the ark of the covenant of God was there in those days, 28 and Phinehas the son of Eleazar, son of Aaron, ministered before it in those days), saying, "Shall we go out once more to battle against our brothers, the people of Benjamin, or shall we cease?" And the Lord said, "Go up, for tomorrow I will give them into your hand." 29 So Israel set men in ambush around Gibeah. 30 And the people of Israel went up against the people of Benjamin on the third day and set themselves in array against Gibeah, as at other times. 31 And the people of Benjamin went out against the people and were drawn away from the city. And as at other times they began to strike and kill some of the people in the highways, one of which goes up to Bethel and the other to Gibeah, and in the open country, about thirty men of Israel. 32 And the people of Benjamin said, "They are routed before us, as at the first." But the people of Israel said, "Let us flee and draw them away from the city to the highways." 33 And all the men of Israel rose up out of their place and set themselves in array at Baal-tamar, and the men of Israel who were in ambush rushed out of their place from Maareh-geba. 34 And there came against Gibeah 10,000 chosen men out of all Israel, and the battle was hard, but the Benjaminites did not know that disaster was close upon them. 35 And the Lord defeated Benjamin before Israel, and the people of Israel destroyed 25,100 men of Benjamin that day. All these were men who drew the sword. 36 So the people of Benjamin saw that they were defeated. The men of Israel gave ground to Benjamin, because they trusted the men in ambush whom they had set against Gibeah. 37 Then the men in ambush hurried and rushed against Gibeah; the men in ambush moved out and struck all the city with the edge of the sword. 38 Now the appointed signal between the men of Israel and the men in the main ambush was that when they made a great cloud of smoke rise up out of the city 39 the men of Israel should turn in battle. Now Benjamin had begun to strike and kill about thirty men of Israel. They said, "Surely they are defeated before us, as in the first battle." 40 But when the signal began to rise out of the city in a column of smoke, the Benjaminites looked behind them, and behold, the whole of the city went up in smoke to heaven. 41 Then the men of Israel turned, and the men of Benjamin were dismayed, for they saw that disaster was close upon them. 42 Therefore they turned their backs before the men of Israel in the direction of the wilderness, but the battle overtook them. And those who came out of the cities were destroying them in their midst. 43 Surrounding the Benjaminites, they pursued them and trod them down from Nohah as far as opposite Gibeah on the east. 44 Eighteen thousand men of Benjamin fell, all of them men of valor. 45 And they turned and fled toward the wilderness to the rock of Rimmon. Five thousand men of them were cut down in the highways. And they were pursued hard to Gidom, and 2,000 men of them were struck down. 46 So all who fell that day of Benjamin were 25,000 men who drew the sword, all of them men of valor. 47 But 600 men turned and fled toward the wilderness to the rock of Rimmon and remained at the rock of Rimmon four months. 48 And the men of Israel turned back against the people of Benjamin and struck them with the edge of the sword, the city, men and beasts and all that they found. And all the towns that they found they set on fire.